JAC 2018 Chandigarh details can be checked from this page. The online registration for JAC Chandigarh counselling 2018 has been started. The Joint Admission Committee 2018 is conducting counselling for JEE Main 2018 qualifiers, seeking admission in UIET Chandigarh, UICET Chandigarh, UIET Hoshiarpur, PEC University of Technology, CCET Chandigarh, and CCA Chandigarh. Candidates may check it from the link below. To know more about JAC Chandigarh 2018 keep on reading the article. Latest: Candidates can submit their fee refund request till Aug 27 2018 up to 5:00 PM. The candidates can submit the application fee amount online, through various payment gateway. 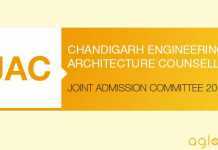 Joint Admission Committee has started the choice filling for JAC Chandigarh Counselling. Candidates can check the same through the link provided below. Click Here for JAC Chandigarh Round 3 Choice Filling. Click Here to check the Eligible Candidates for Choice Filling. The selection procedure of JAC Chandigarh states that the candidates must have secured suitable JEE Main 2018 AIR. For B.Tech and B.E admission – JEE Main Paper 1 AIR will be considered. For B.Arch admission – JEE Main Paper 2 AIR will be checked. JEE Main 2018 is a national level exam, which is conducted by CBSE for B.E/B.Tech and B.Arch/B.Plan admission in India. The All India Rank for Paper 1 and 2 has been released by CBSE. The candidates may check it from here. JAC will prepare its own inter-se merit list. As per that merit list, the candidates will be called for seat allotment. It is vital that the qualifying exam must have been passed in 2016 or 2015. The candidates, who appeared for the qualified exam in 2018 may also apply. If a candidate appeared for class 12 exam in 2014 but passed it in 2015, due to any reason, is not eligible. In the qualifying examination, the candidates must have studied at least 5 subjects and out of these the core subjects should have been Physics, Mathematics, and Language. Candidates must have also secured 60% marks in the qualifying exam. The candidates belonging to SC/ST/PwD/BC category need to secure 55% marks only. The candidates must have qualified 10+2 with Mathematics as one of the core subjects. In 10+2, the aggregate marks of the candidate should not be less than 50%. Step – 2: Online Choice Filling – After the registration, the candidates will be able to login and submit details in the application form. All registered candidates are required to submit their choices of Institute and Branch in order of their preference. Candidates are required to submit single set of combined choices for Engineering & Architecture streams, if they are eligible for both the streams. Choice filling is OPTIONAL for those candidates who are eligible only for Architecture as per JEE (Main)-2018. Only one choice of Architecture in CCA will be considered automatically after successful registration. Candidates can fill in as many numbers of choices in the order of preference as they wish to, from the list of available choices. Candidates are permitted, if they so desire, to change or re-order their choices, delete earlier choices and add new choices any number of times until they lock their final set of choices. Based on the number of registered candidates who have submitted their choices at any given time, the system will be able to provide an idea of the seat that may be allotted. This indicative seat availability (‘Mock Counselling’) is to help the candidates to finalize the most appropriate choice of Institutions. The indicative seat availability will be displayed twice during the specified period on the website. Candidates are advised to visit the website regularly for this purpose. The final allotment of seat, in the allotment rounds, may be different than the indicative seat availability. Candidates MUST lock their choices only after they have finalized them, but in any case, before last date & time. The locking of choices involves a few steps after the LOCK button is clicked. This includes: re-entering the password and confirming the locking etc.. Candidate should follow all the steps carefully to complete the locking procedure. After the choices are locked, candidates will not be able to change their choices. A printable version of the choices along with the terms and conditions agreed by the candidate at the time of registration is displayed only if the choices are locked. If a candidate fails to explicitly lock the choices by last date & time, the last saved choices will be automatically locked after the deadline. Candidates are therefore strongly advised to lock their choices themselves and secure a printout of these locked choices. Registered candidates who do not exercise any choices in any of the round will not be considered for seat allotment. However, they will be eligible for SPOT round of Counselling after depositing a SPOT round participation fee of ₹40,000/-. The candidate can login again to view the locked choices. However, the locked choices cannot be modified or altered. Step – 5: Seat Allotment – The allotment of seat will be done online. Apart from this, the candidates will also be informed about the allotment through SMS. The candidates will have to accept the allocated seat or they may also withdraw if they are not satisfied with allotment. To accept the seat, the candidates will have to pay Rs. 40000. The amount of fee can be paid through Net Banking, Debit/Credit Card, and E-challan. In this round of seat allotment, a combined seat allotment process will be executed including Sports & Defence candidates. Successful allotted candidates are required to pay the admission fee and submit the willingness for upgradation for the subsequent rounds, failing which their allotted seat will automatically be cancelled and the candidate will not be considered for subsequent rounds of Counselling except SPOT Round of Counselling. Based on candidate’s fee payment and willingness, admitted seats and vacant seats will be displayed for 2nd round of Counselling. Not paid Admission Fee after first round of allotment. Withdrawal after getting admission in first round. Type–I: Registered candidates who were not allotted seat in the 1st round. This type of candidates may visit the website and modify their earlier choices (OPTIONAL) else choices submitted in the 1st round will be considered in this round. Type–II: Candidates who were allotted a seat in the 1st round of Counselling and paid the admission fee and submitted willingness “Noupgradation”. Type–III: Candidates who were allotted a seat in the 1st round of Counselling and paid the admission fee and submitted willingness “Yesupgradation”. No fresh registrations would be allowed in third round of Counselling. Not paid Admission Fee after 1 st/2nd round of allotment. Withdrawal after getting admission in 1 st/2nd round. Type–I: Registered candidates who were not allotted any seat in the 1st/2nd round of allotment. This type of candidates may visit the website and modify their earlier choices (OPTIONAL) else choices submitted in the 1 st/2nd round will be considered in this round as well. Type–III: Candidates who were allotted a seat in the 2nd round of Counselling and paid the admission fee and submitted willingness “Yesupgradation”. All the candidates who have paid the admission fee after seat allotment in first round or in second round or in third round will have to physically report to the final Allotted Institute as per Admission Schedule, to complete the admission process and subsequently attend the classes. All participating institutes are required to update the Physical Reporting status of the candidates online so that actual reported seats and vacant seats could be calculated for last SPOT round of Counselling. Final vacancy for SPOT round of Counselling will be published on the website before choice filling for SPOT round. 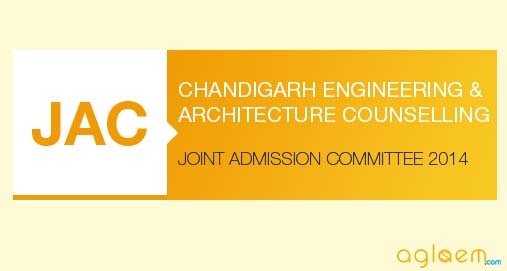 If you have any queries regarding JAC Chandigarh 2018 Engineering/Architecture admissions, please ask in comments below. Is there any seat for ST in B.Arch ?? can I get admission in CCA with ST Rank 171 ?? MY FEE PAYMENT DETAIL IS:- TRASACTION No. IS:- CPH5702020, TRASACTION AMOUNT :- 1050, TRASACTION DATE IS :- 06-06-2018.